This explosive sequel to The Myth of Nazareth documents astonishing scandals on the ground and a desperate race to create evidence for the nonexistent hometown of Jesus. Was any prophet at the source of Christianity? with a Foreword by Frank R. Zindler. —Dr. Robert Eisenman, author of James the Brother of Jesus, The New Testament Code, and liberator of the Dead Sea Scrolls. Through groundbreaking investigative research carried out over the last decade on three continents, in NazarethGate Salm reviews the increasingly desperate forgeries, misrepresentations, and boldfaced lies being perpetrated today at the very heart of the Christian religion. 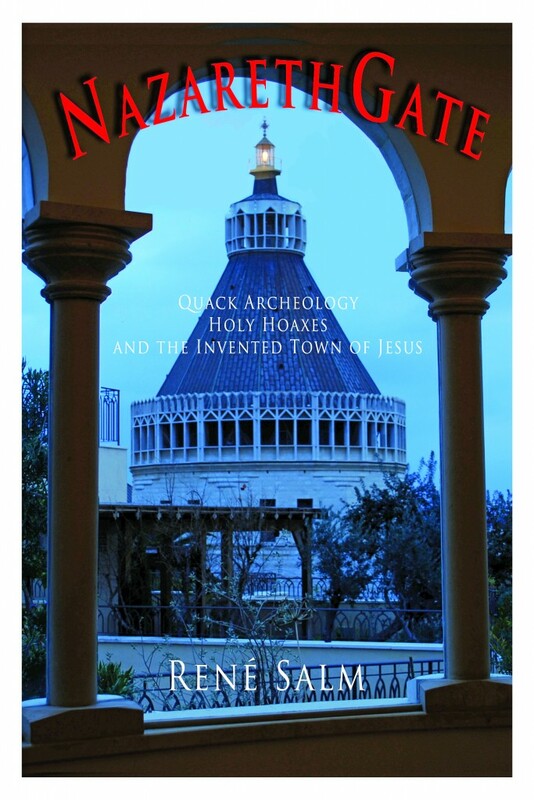 In a readable but eminently rigorous manner, the book combines under one cover the author’s previously published journal articles on Nazareth (six chapters) together with astonishing new unpublished material (eight chapters)—a forged Nazareth inscription currently being used to “prove” the Roman existence of the settlement; the “house from the time of Jesus” which was actually a wine making complex; “Hellenistic” coins which are in fact from much later times—and much more. This chapter introduces the subject and chronicles the author’s engagement with the idea that Nazareth did not exist in the time of “Jesus,” beginning with online scholarly discussions in the CrossTalk forum in the late 1990s, and continuing through publication of The Myth of Nazareth (2008). These two chapters are reprints of articles first published in American Atheist magazine. The reader is given a short historical review of the Nazareth basin from the Stone Age through Roman times as well as a summary of the contents of The Myth of Nazareth, arguing that the material remains (particularly the earliest oil lamps and tombs) show without doubt that no settlement existed in the Nazareth basin at the turn of the era. First published in the 2008 issue of the Bulletin of the Anglo-Israel Archaeological Society (BAIAS), this chapter is a sharp response to shortcomings of the Pfann-Voss-Rapuano “Final Report” on the archaeology of the Nazareth Village Farm (NVF). Salm shows that the NVF report had false Hellenistic–Early Roman pottery claims, and also that it was laden with errors of “double dating” (the same pottery shard given two widely different dates). This Response provoked an embarrassing 22-page Amendment published in the subsequent issue of BAIAS. This is the author’s third article on Nazareth published in American Atheist magazine. It introduces tensions in modern New Testament archaeology, and also discusses the recent curious Nazareth work of Dr. Ken R. Dark (taken up in more detail in Chapter 6). • Chapter 6: A Critique of Ken Dark’s Writings Relative to the Sisters of Nazareth Convent (pp. 71–120). Other than the Introduction, this is the first chapter of NazarethGate not previously published. Dark has worked at the Sisters of Nazareth Convent annually for several seasons (never excavating, however). He produces astonishing theories of the site, including that a ‘house from the time of Jesus’ was there before the tomb now clearly evident. Salm shows that the archaeological remains, however, are inconsistent with a dwelling but are those of agricultural installations (including a large silo and filtration basins) which appeared after the tomb. I also show that Dark is embarrassingly unacquainted with Jewish tomb chronology, that he misuses Jerusalem datings, and that he misrepresents the work of other scholars. This is the last of Salm’s four articles published in American Atheist magazine. It reacts to the worldwide publicity at Christmas, 2009, regarding a “house from the time of Jesus.” The author had not yet examined in detail the material evidence from the site but knew that the worldwide publicity contradicted the short IAA report in his possession. As it turns out (see Chapter 10), the site was not a dwelling at all but an ordinary wine making installation in antiquity! This chapter reviews the material evidence from the Nazareth basin in a nontechnical way. It also highlights the lack of scientific rigor in this very sensitive subfield of New Testament archeology where mere assertions still pass for scientific evidence. This chapter was originally a paper delivered at the 2009 SBL annual meeting (Chicago). This is a reprint of the author’s contribution to the 2013 book entitled Bart Ehrman and the Quest of the Historical Jesus of Nazareth, edited by F. Zindler (American Atheist Press). The book was a reaction to Ehrman’s 2012 book Did Jesus Exist? In that rather superficial book, Ehrman devotes several pages to the existence of Nazareth question. However, he misses the main points of Salm’s argument and relies on hearsay at third hand for his (false) information. The most technical chapter in the book, its 66 pages react to the reports which went ‘global’ at Christmas, 2009—reports claiming the discovery of a house “from the time of Jesus” in Nazareth (see Chapter 7). Analysis of the material remains, however, quickly showed the impossibility of that claim and that the site was no more than an ordinary wine making installation in Late Roman–Byzantine times. In 2011 the excavation site became part of the new International Marian Center, a four storey complex which now includes a multi-screen movie theater, restaurant, and boutique. This chapter considers the 2012 book-length ‘final report’ from archaeologist Y. Alexandre regarding the 1997–98 excavations at Mary’s Well. It demonstrates that claims of Hellenistic coins, pottery, and even structures at the site are invalid. Human activity in the area began in Middle Roman times when the channels were constructed, bringing water to the site for the first time. Hence, no coins and pottery (all “water worn”) could have entered into those water channels in Hellenistic or Early Roman times. When the author engaged the IAA to produce proof of their claimed “Hellenistic” coins, the result was astonishing, for the photographs subsequently taken by the IAA showed water worn, totally unreadable coins (the reader is able judge, for two of the photos will be reproduced in the book)—dramatically exposing the full extent of dissimulation regarding the claimed material evidence. This chapter is an eye-opener and arguably the high point of NazarethGate. This chapter deals with the now-proven forgery by Jerry Vardaman of the much-touted inscription which constitutes the only Roman-era, non-Christian epigraphic evidence for a settlement of Nazareth. Vardaman was the conservative scholar who in the 1960s claimed to see “microlettering” attesting to Jesus Christ on Roman coins. He never produced any primary evidence for that claim, however. This chapter is the result of remarkable investigative research on three continents, conducted by the author and two colleagues. This chapter summarizes the contents of NazarethGate. It also will focus on the embarrassing fact that several Roman-era tombs exist directly under the Church of the Annunciation—one of the most venerated Christian holy sites in the Middle East. The Virgin Mary did not live there, for Jews did not inhabit the vicinity of tombs. In any case, the tombs are later, dating from the Middle Roman period, and no evidence has been produced which goes back to “the time of Jesus.” A final section will apprize the reader of the current status quaestionis. You don’t want to miss this engrossing and thoroughly researched sequel to The Myth of Nazareth.